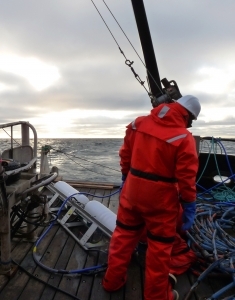 Launched at Oceanology in London in March 2008, the new CSP-S seismic power source from Applied Acoustics has recently been proving its worth in the Arctic basin off the north Alaskan coast. 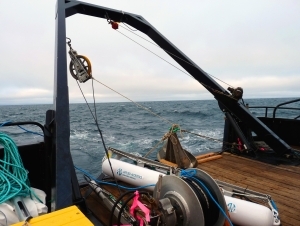 The 6000J unit deployed in The Chukchi Sea is being used with the AAE Delta Sparker to achieve ultra high resolution (UHR) seismic data for a geohazard survey. Such surveys provide the data for detecting the presence of shallow gas-bearing formations, active faulting and potential hydrate zones beneath the seabed which can prove dangerous when drilling offshore. The CSP-S and Delta Sparker offer a number of advantages for UHR surveys as the system is easier to install, easier to operate, has less maintenance and needs less specialist personnel than using an air gun arrangement. The acquisition specifications demanded a 48-channel high resolution streamer; two second record length and 0.5mS sample interval. This requirement for a charge rate of 6kJ every 2.5 seconds was well within the capabilities of the energy source unit at 3kJ per second. The client specified a good mix of penetration and resolution so had considered using two of the Applied Acoustics' sparkers, the Squid 2000J and the Delta in tandem, but found the results from the Delta, with a penetration of over 800mS and resolution to 30cm, were sufficient so the other high resolution Squid sparker was not needed. This greatly improved operational efficiency. 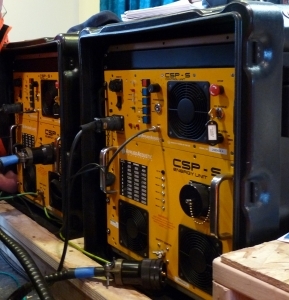 Such speed of operational deployment and execution is crucial when working in the severe, cold conditions of the Arctic, so the CSP-S and Delta 'package' offers an ideal solution as the system is two-man deployable, quick to mobilise and it only requires a readily available single phase generator on a vessel of opportunity. No expensive, weighty air compressor is required. Even though the CSP-S is the largest of the seismic power units from Applied Acoustics it still fits into a robust, shock-mounted 12U transit case which is easily transportable. The project was mobilised in the Western Alaskan frontier port of Nome in the autumn of 2008 with the spectre of sea-ice forming. The installation and testing of all survey sensors was complete in three days and operator and HV awareness training was performed in one day. This allowed land seismic observers with no previous marine seismic experience to safely operate and maintain the CSP-S and Delta Sparker. The Delta Sparker was also subject to a Seismic Source Verification inspection to ascertain the safety shutdown radius which is an environmental concern. Due to the time pressures the survey was performed 'single pass' with all survey equipment deployed to maximise weather windows, often working in what is generally described as 'marginal' but in the Chukchi is described as 'typical' sea states. This tested the equipment's mechanical design and the survey crew's endurance to the limits but the quality of data achieved in such challenging conditions was high. Neil MacDonald, Technical Manager of Applied Acoustics explained: "Our customer had some specific requirements - not only good quality high resolution data of course, but also an efficient operation in spite of the harsh environment." Applied Acoustics has back-up safety circuits as standard in all of their CSP units as recommended by the UK Health and Safety Executive. Output current is monitored shot by shot for fault conditions for example, and if a fault does occur any energy is rapidly dissipated internally. The company's range of energy source units consists of four standard units from 50J, for general coastal or river surveying, up to 6000 Joules for deeper penetration of the sediment layers.